Three days after California businesses began selling marijuana for recreational use, a policy change by the federal government has sparked uncertainty about the future of legalized cannabis and provoked sharp reactions from officials in the state and around the nation. The Obama administration’s hands-off approach had paved the way for a growing number of states to legalize cannabis use and boosted the multibillion-dollar marijuana industry. U.S. House Minority Leader Nancy Pelosi (D-Calif.) said in a tweet that Sessions’ decision was “shameful” and an insult to the democratic process. The attorney general’s announcement did not clarify whether prosecutors would pursue federal charges against marijuana businesses or seek to disrupt the rapidly expanding market. Despite the new policy, California planned to continue issuing licenses to businesses that want to sell pot for recreation. The chief of the state’s new Bureau of Cannabis Control, Lori Ajax, said she plans to defend California’s law and continue efforts to implement regulations both for medicinal and recreational marijuana. “We expect the federal government to respect the rights of states and the votes of millions of people across America, and if they won’t, Congress should act,” Ajax said. 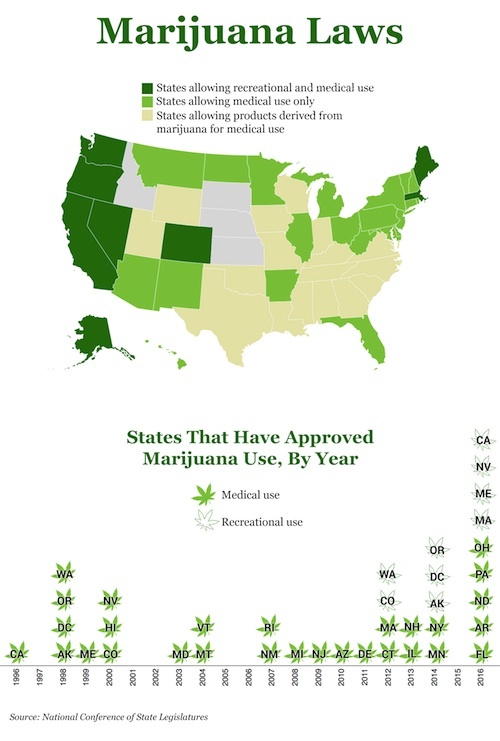 A total of 29 states have legalized marijuana for medical use. The health effects of the drug and its legalization are widely debated. Advocates say that cannabis can relieve pain, ease chemotherapy-related nausea for cancer patients and stimulate the appetites of AIDS patients — arguments that have helped propel states to allow marijuana for medicinal purposes. But critics cite a rise in emergency room visits and impaired driving in states where marijuana is legal for recreational use. In addition, marijuana can affect cognitive functioning, and people who use it long term can suffer from an obscure illness that causes extreme abdominal pain and vomiting. The federal government’s shift to a more marijuana-adverse stance is unlikely to have a big impact on states that have legalized marijuana, said Robert Mikos, a law professor at Vanderbilt University and an expert on drug law and federalism. That’s because Sessions left it up to the country’s individual U.S. attorneys, who must decide whether to go after the marijuana industry. Mikos said many U.S. attorneys will be reluctant to crack down on popular marijuana reforms, especially if they have plans to run for higher office. They also may hesitate to redirect funds from other key priorities, including the opioid crisis, he said. Opponents of legalized marijuana said that the federal U-turn could stem the growth of the marijuana industry and curb mass marketing. “It is a good day for public health,” said Kevin Sabet, an assistant professor of psychiatry at the University of Florida. Sabet said the Sessions policy is not aimed at individual users but rather the marijuana industry as a whole. Governors in several states where marijuana is legal issued statements saying that Sessions’ new policy subverted the will of voters and committing themselves to uphold their state laws. Washington Gov. Jay Inslee, a Democrat, said the state has a well-regulated system that keeps “criminal elements” out. “We will vigorously defend our state’s laws against undue infringement,” he said. Oregon Gov. Kate Brown, also a Democrat, said the voters in her state were clear when they decided to legalize marijuana, and the federal government shouldn’t stand in their way. “My staff and state agencies are working to evaluate reports of the Attorney General’s decision and will fight to continue Oregon’s commitment to a safe and prosperous recreational marijuana market,” Brown said. “I will continue to work with the U.S. Department of Justice and our congressional delegation to prevent federal overreach into Alaska,” he said. Marijuana is the most commonly used illicit substance in the United States, and the trend of states bucking its prohibition in favor of taxing and regulating it reflects a broad cultural shift toward greater acceptance. That could make it even harder for the federal government to enforce its laws, Kleiman said. A Gallup poll from late last year found that 64 percent of Americans believed cannabis should be legal. A February survey by Quinnipiac University found that 71 percent of U.S. voters want the federal government to respect state marijuana laws. In that survey, majorities of Republicans, Democrats, independents and every age group agreed the feds should not enforce prohibition on states that have legalized marijuana. Carmen Heredia Rodriguez contributed to this story. This story was produced by Kaiser Health News, which publishes California Healthline, an editorially independent service of the California Health Care Foundation.